If UFC featherweight champion Conor McGregor (pictured) has his way with Nate Diaz Saturday at UFC 196, as the 5.5-1 odds-on favorite has predicted he will, McGregor may never defend the title he just captured in December. 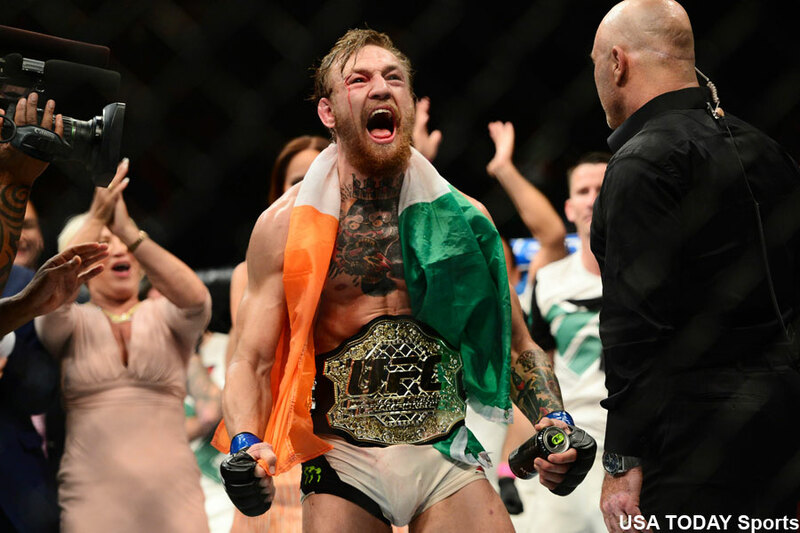 McGregor was originally slated to challenge lightweight champ Rafael dos Anjos for his crown tonight to try and become the first fighter in UFC history to simultaneously own two titles. However, when dos Anjos broke his foot at the 11th hour, Diaz agreed to serve as substitute on just 11 days’ notice. The two agreed to meet in a welterweight affair given the last-minute nature of the situation, which meant McGregor would jump two weight classes, 25 pounds, in only three months. UFC president Dana White believes that if McGregor waxes Diaz in his UFC welterweight debut, his days at featherweight might be over. After knocking out Jose Aldo in merely 13 seconds to unify the featherweight belt, McGregor said he would not relinquish that strap if he pursued dos Anjos’ lightweight throne. He was adamant about becoming the first two-way champion the UFC has ever known. However, a lightweight move would have only forced McGregor to pack on 10 additional pounds. A successful transition to welterweight, then back down to featherweight would be far too taxing on his body – particularly since McGregor insists on fighting every few months. White believes McGregor will understand that and won’t have a problem vacating his featherweight belt. “That would be a non-issue if he wasn’t going to go back,” White added. “When you’re dealing with Conor McGregor, he’s a smart guy. He gets business. He’s not unreasonable about anything, and he will fight anybody, anywhere, any time. How could anybody have a problem with that? It has been rumored that if McGregor posts an impressive finish tonight against a game Diaz, he could challenge welterweight champ Robbie Lawler for his hardware at UFC 200 on July 9. That would certainly make it easier for McGregor to leave his featherweight belt in his rear-view mirror. First things first, however. McGregor must get past Diaz tonight inside MGM Grand Garden Arena in Las Vegas.